Here is “Smartcloud”, the very last version of Pearltrees. 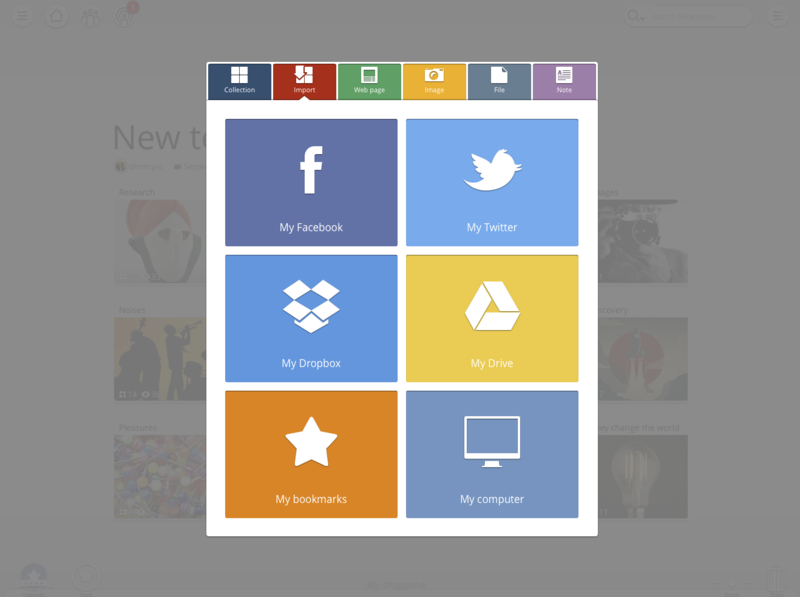 It lets you import and organize your social networks’ history or everything you’ve stored on line. Starting today, you’ll be able to put your hands back on the hundreds or the thousands of content you’ve shared over the last years. Plus, it’s quick and easy to do. The “add” button, the one with the “+” symbol, gives you access to the imports. There you can recover your social networks’ history, your cloud storage services files and your search results. With a few clicks, you can add in your account hundreds or thousands of photos, tweets, Facebook posts, Drive or Dropbox files… Thanks to the imports, you will recover the memory of your life on the Internet. When imported contents are massive, an auto-organization algorithm starts to help you. Then, your imported contents are automatically organized into collections by topics and by dates. No magic here but an algorithm that relies on both the millions of contents already organized by Pearltrees users and an original technology of semantic analysis at large-scale. Basically, Pearltrees takes advantage of the collective intelligence of the community to sort your contents. Don’t hesitate to make imports even if they are massive, we organize them for you! We have improved all the organization and customization features to let you easily add your personal touch to your collections. Now, everything is working according to the context. When you hold an item, the “My account” column opens up to let you drop it exactly where you want. When you hover a collection of yours, a small “add” button appears to let you insert the right content exactly at the right place. 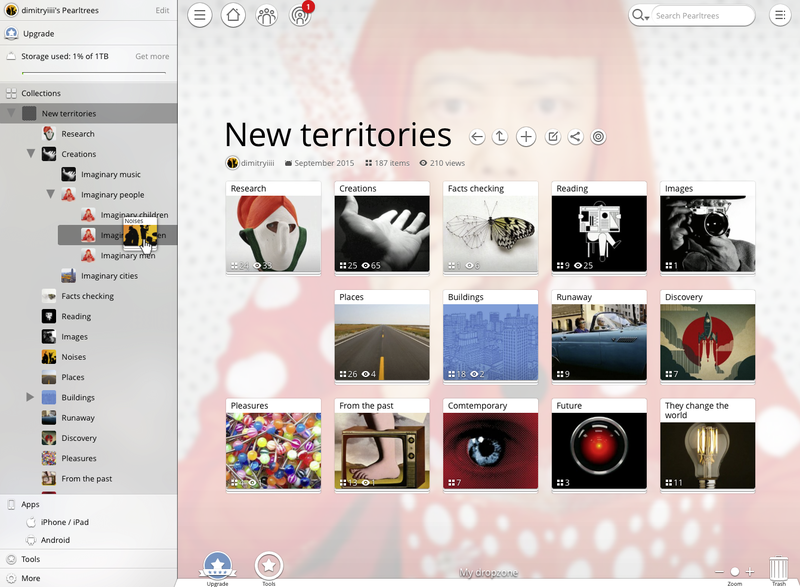 Your content is showcased like never before in Pearltrees. 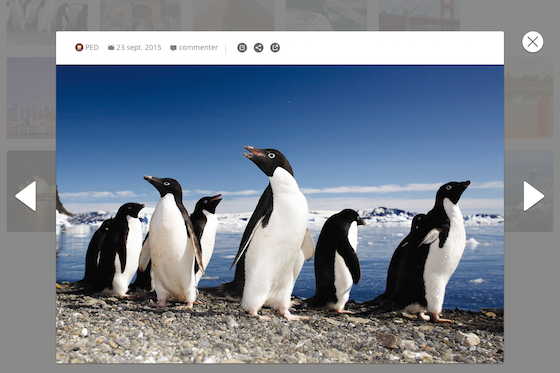 Explore your photos, videos and all your web content in an all new reader. Import, organize, enjoy. Pearltrees “Smartcloud” is available today on the web. Mobile app will be available in the Google Play Store and in the AppStore shortly. Happy pearling! Please, assume your choices ans change the name of your product..
No trees anymore.. and square pearls..